The further back in television history you go, the greater are the gaps in the archival record of transmitted material. This is actually true of most areas of cultural activity - it takes a certain time before the demand for an archive grows loud enough to be met. In television, the ability to create archives of output was further hindered by technical and financial factors. The earliest material was live and unrecordable until the introduction of telerecording in the late 1940s, but this was sparingly used and most of what remains from the 1950s is that which was originally shot on film. The introduction of videotape at the end of that decade brought a switch from primarily live to primarily recorded production, but this didn't immediately create a comprehensive archival record because the high cost of tape meant that it was considered preferable to wipe and re-use it. What's more, re-use and rights restrictions meant that drama and entertainment programmes were most likely to be discarded. All the same, some of these discarded programmes did survive - at overseas television stations or archives, in the possession of those involved in the production, or in the hands of private collectors. Since 1993, the BFI , in association with the BBC , ITV , and the classic TV fans' organisation Kaleidoscope , have been running a campaign called Missing, Believed Wiped to locate and recover television programmes known to be missing from the public and broadcasting archives. The campaign has had a number of notable successes over the years: the two lost series of Steptoe and Son (BBC, 1962-74) restored by the BFI from copies kept by writers Galton and Simpson ; the BBC's recovery of two missing Dad's Army (1968-77) episodes from a collector; a lost Dennis Potter play uncovered at LWT . But the collection uncovered at the Library of Congress in 2010 surpasses everything else in scale, quality and vintage, comprising as it does more than 60 classic dramas originally transmitted on BBC or ITV from 1957 to 1969 - well over 100 hours of material. These titles formed part of a collection of over 20,000 items donated to the Library of Congress by US National Educational Television (the forerunner of the Public Broadcasting Service which replaced it at the end of the 1960s), through its flagship channel WNET/Thirteen, New York . Then, as now, British productions of literary classics were seen as quality television, and frequently imported for transmission by WNET . Fortunately, they were also retained and handed over to the Library of Congress, where they remained uncatalogued until a researcher looking for productions of Shakespeare found some of them and noted the presence of others. Later, browsing the Kaleidoscope website, he noticed that many titles he remembered were listed as missing and the process of identifying the collection was underway. 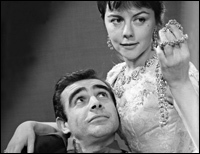 Most of the rediscovered programmes are television versions of stage productions or literary adaptations, though there are also some contemporary dramas, such the two Wednesday Plays from 1965: 'Auto Stop' , starring David Hemmings , and 'The Bond' , with Hannah Gordon . The 1967 National Theatre production of Much Ado About Nothing (BBC), with a cast including Derek Jacobi and Maggie Smith , leads the Shakespeare element, which also includes Don Taylor 's 1962 A Winter's Tale (BBC), and a 17-year-old Jane Asher in Romeo and Juliet (ITV, 1962). Works by Chekhov and Ibsen are also prominent and French writing, both classic and modern, features significantly, including Sean Connery in Jean Anouilh 's Colombe (1960) and Leonard Rossiter and John Le Mesurier in Jules Romains 's satire Doctor Knock ( Theatre 625 , 1966). The anthology series of stories by Georges Simenon , Thirteen Against Fate (BBC, 1966), is recovered almost complete, while all eight parts of Granada 's 1963 series The Victorians , produced by Philip Mackie , were also found. Another Mackie production for Granada , The Changeling (1965) features well-known 1960s TV faces Nerys Hughes and Patrick Troughton before the roles which made them famous, while Troughton also appears, alongside Jack Smethurst , Gretchen Franklin and a cast of almost 100, in the ambitious 1960 BBC production of The Insect Play . Possibly the most interesting single item, though, is the 1965 remake of Nigel Kneale 's controversial 1954 TV screenplay of George Orwell 's 1984 . Although examples of classic drama from this period did already exist in the archives, the discovery of this collection highlights the sort of output that was relatively common fare on British television - even on commercial TV - in the 1950s and 60s, but is now very rare: seemingly confined to BBC Four or Sky Arts . Apart from Shakespeare, most of the dramatists featured in the collection have virtually disappeared from the screen, as has more contemporary stage work. Even the original dramas in the LOC find (there were more than two Wednesday Plays in the WNET collection, though the others weren't missing) seem a relic of past television output. As a whole, these rediscoveries reveal a great deal about the early development of television drama, and return to us an exceptional record of great productions and performances.